Yes I know, I come across a an Isabelle Faust fan boy (see my review of her Brahms concerto here and of her contribution to the Schumann trio here). Well what the heck, I stand by it, she’s great. And in the fabulous combination with Alexander Melnikov even more. Their Beethoven violin sonatas are my absolute favorite version. And now they release a Brahms recording! As you have seen from the title of my blog, I’m a big Johannes fan as well. So, expectation were high, high enough for me to even pre-order the album (don’t know why I bother doing this, it’s not that you get it any sooner, and I could otherwise stream the content before making my purchase to check). Well, call it dedication, or silliness. Well, this one’s got tough competition, as my reference version is none less than Szeryng and Rubinstein for op. 108! (to be fair, this was also my first ever recording of the sonatas, so I may be biased. On top of the sonatas 2&3 (op. 100 and 108) from Brahms, you get a set of Romances (op. 94) by Schumann, and a very rarely played work, the “F.A.E.” (“frei aber einsam“, free but lonely) collaboration of Brahms, Schumann, and Schumann’s unknown pupil Albert Dietrich. Frei aber einsam was the motto of Joseph Joachim, the famous violin player, friend of both Schumann and Brahms, he actually introduced the two in the first place. Both “fillers” are beautiful pieces that are well worth being discovered. But you’ll obviously buy this mainly for the sonatas, and you won’t be disappointed. Alexander Melnikov plays a beautiful 1875 Bösendorfer period instrument, and Faust her regular “Sleeping Beauty” Stradivarius. You get energy, passion, but also extremely nuanced quieter moments. Does this kick my Szeryng/Rubinstein version from the throne? Maybe not quite. But it stands on equal foot right next to it. Highly recommended. Plus you get the beautiful Harmonia Mundi sound. P.S. My iMac bluetooth keyboard is going nuts, the “s” and “w” keys don’t work properly any more. Have you ever noticed how ubiquitous the letter “S” is? And guess what pleasure it is writing a post about “sonatas” without the letter “s”…. This took forever to write! UPDATE Sep 29: Just noticed the latest Classica gave this album a “Choc”, i.e. 5 stars as well. I listened to it via Qobuz and it’s not one of my favourite recordings. I think the problem is technical – the violin is too far in the background. It feels as if you are listening to the performers with your head inside the piano. My reference recording of Brahms is still Perlman/Ashkenazy. 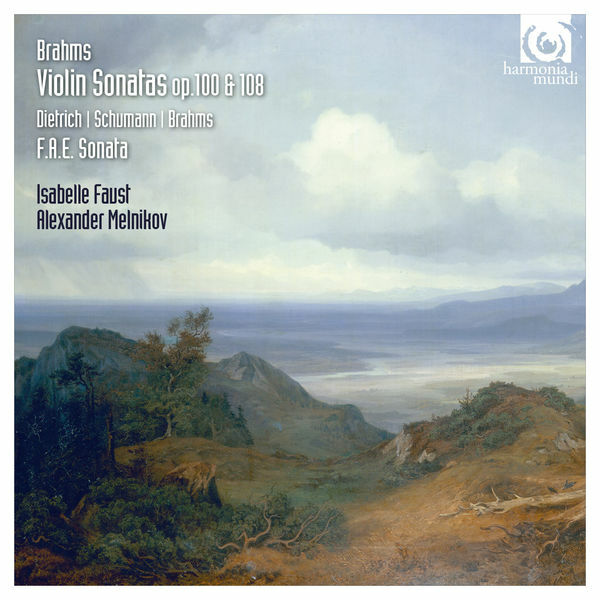 A really great recording of Brahms 3rd sonata is by Patricia Kopachinskaja and Fazil Say. It is such a fresh and passionate recording. I don’t think it was released officially because I can only find it on YouTube. Thanks for your feedback. I understand what you mean, Faust is recorded with a lot of space and a bit in the background. The effect is more pronounced on headphones than on speakers by the way. That said, I like the recording quality, it is very resolving and nuanced, with very limited compression. I do have Perlman as well and agree they are good. A Kopachinskaya/Say recording I’d buy immediately, I’ve seen the two together play Beethoven live, and the level of energy was outstanding. Need to check out the YouTube clip. Pingback: Itzhak Perlman - Where To Start? I just stumbled over this album when looking for pieces featuring Isabelle Faust. Yeah, I am another fan of her. She will be in Luxembourg in a couple of weeks and I will be in the audience! I’m jealous. Every time she comes near my place I’m busy traveling. I feel that way with Julia Fischer. And Alice Sara Ott. If I weren’t too old for that, I’d say I am male groupie! Thanks for your kind words. I haven’t considered guest posting yet but would be potentially open. What kind of post did you have in mind?